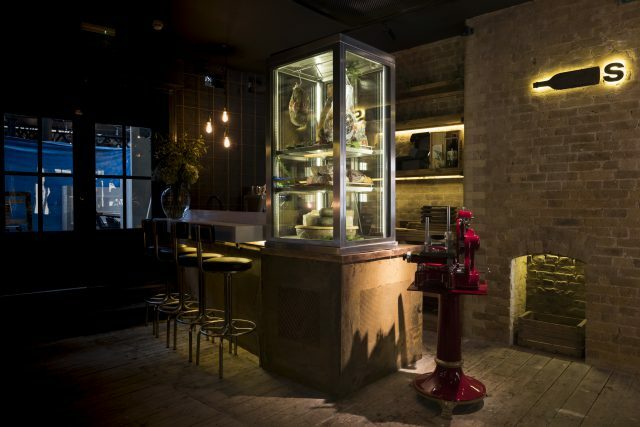 At Bottles in London’s Spitalfields, guests can explore wines from Italy and beyond at the wine bar which boasts a sustainable kitchen, terrace and communal counter. Bustling wine bar and terrace, boutique and deli, Bottles in Old Spitalfields Market is a close friendship between Semprini (‘Bottles & Battles’, Mercato Metropolitano, SE1) and housemates, Carlo Deho and Michele Pompili (‘Sood Family’) who cut their teeth running supper-clubs and street food stalls in East London. Fresh pasta might be formed from offcuts honouring the kitchen’s “zero-waste” policy, enriched with nduja, while platters include the one-meter long cheese and charcuterie board; this is also one of London’s few venues offering an Ibérico pork tartare. Semprini, who describes wine as “medicine”, has hospitality in the bloodline (his aunt runs Crossharbour’s Floating Lotus) mentions he dropped out of university a decade ago, pursuing a career in wine initially at Kent’s Chislehurst Wines before becoming buying assistant to Alistair Morrell at Mayfair’s Hedonism. His CV also includes Armit and Liberty Wines. Deho trained as a lawyer, contending with cross-continental inheritance tax feuds by day while earning his keep in restaurants by night, ultimately deciding hospitality was more enjoyable.